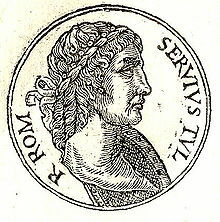 A 16t-century depiction o Servius Tullius. Servius Tullius wis the legendary saxt keeng o Roum, an the seicont o its Etruscan dynasty. This page wis last eeditit on 4 Juin 2015, at 23:13.